Our Rhubarb Oat Bread is moist, full of flavor, and super delicious (my grandkids love it)! 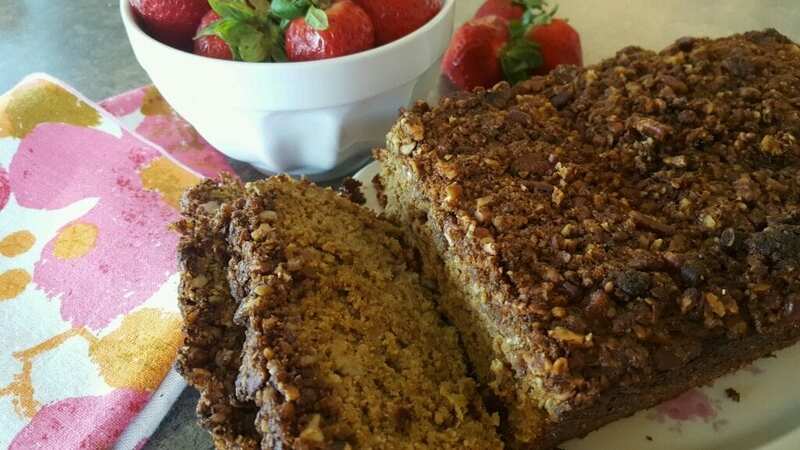 My grandson said “It’s the best rhubarb bread I have ever tasted.” This grandma couldn’t help but to smile and wonder how many different rhubarb bread recipes this 10 year old has already tasted in his lifetime. He was insistent that his mom get this recipe. Nutrients abound in this rhubarb oat bread. From the rhubarb, to the coconut. And, after making the rhubarb sauce for this recipe, you will have 2 cups of sauce leftover to top off your morning oatmeal pancakes (page 209). For more great rhubarb recipes and tips on growing rhubarb, check out our book, Eating Pure in a Processed Foods World®. Preheat oven to 350o F. In a large bowl, beat eggs with a mixer until frothy. Mix in rhubarb sauce, coconut sugar, butter and vanilla. Grind oats in a blender, bullet or coffee grinder. Add oats and remaining dry ingredients. Stir in chopped rhubarb. Pour batter into a buttered 9” loaf pan. For topping; melt butter in a small saucepan and stir in nuts, sugar and cinnamon. Remove from heat and spread topping on batter. Bake 45 to 50 minutes. Remove bread from pan and place on cooling rack. To turn this into a kid-friendly treat, place liners in a muffin pan and pour batter into each liner. Add topping. Bake 20 to 25 minutes or until toothpick inserted into center comes out clean. Remove muffins from pan and place on cooling rack.